Donna, your post has blossomed from what if to a potent message on faith. I like your twists and turns that led you to the poem you wrote and the scripture verses were wonderful reminders that the Lord is the guide on the journey. "He marketh all my paths." - Job.33 It is He who helps us transverse the rockiness of some paths. BTW: I also enjoyed the humor in your piece that shone like a bright light-"...God's over in the passenger seat with all the controls - just like my drivers' ed instructor." If I had to pull a word to sum up thoughts, I would say it is Believe. Thanks for hosting SPJ1stT and starting us off on strong footing. Thanks, Carol! I had to have "alone time", so my husband and son went to dinner and a movie so I could write! Lol! ". . . skip and run on higher ground . . . cause I'm not lost but found." Love this thread of belief that runs through your words. Thanks for sharing these thoughts about your path and your reality that is magnificent and sweet as you've rested peacefully and thankfully in His arms. It's a good path. I enjoyed thinking about it. There were so many paths I could have taken. Thank you for hosting, and I love your take on the subject! I'm looking forward to reading everyone else's! I am excited to see where this path takes everyone! 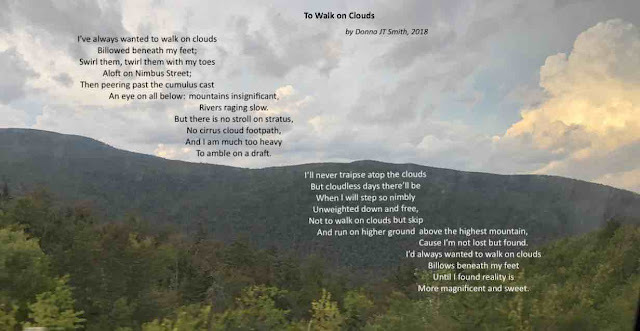 I've had that imaginary dream to walk on clouds. I love all your cloud words in the poem and their metaphorical meanings, but most of all your conclusion, that while we may dream of something better, we should notice the magnificence in our daily lives. Thanks for hosting. I hope to get a post up before the day ends. Looking forward to reading about your path, Margaret! Donna - I love this: "I believe my path has been guided throughout my life, even when I wasn't sure how it was happening." I know what you mean. I want sure this post was going to happen even. The boulders seems to be pretty big this year and the roots especially trippable. Looking forward to smoother paths around the corner.